It seems that I am always buying too many bananas. Honestly I love bananas but I’m more into throwing one in an afternoon smoothie rather than choking one down in the morning. My intent is always there though and as I know my wife enjoys one for a morning snack, I am always hoping that my kids eat them as a grab and go item, but that is rarely the case. With that said, I always have a few left during the week where I quickly make the decision to freeze them for smoothie making. Not this week however! I still think we are all trying to come off the sugar high from the Christmas holiday cookies I made, and believe it or not I still have in bags in the freezer! I have this fear in the back of my head that if we do not have any chocolate present or some form of dessert, well then there will be hell to pay. Kidding, but not really. So I decided to put those bananas to the side, and come up with another banana bread. This time with some simple twists that took it one more step to the awesome side. Making this bread also allowed me to use some of of those holiday baking ingredients which was a win, win in my book. A delicious win, win that is. This recipe doesn’t get any better, and the result is a double chocolate bang of flavor that pairs so perfect with the brown sugar and the slight tartness from the bananas. Not only that but it is essentially one of those mix the dry into the wet, give a final mix and pour into a pan. Bake, rest, and eat. Next, add the dry ingredients to a mixing bowl and mix well. Next to a larger mixing bowl, add in the bananas, butter, egg, oil, sugar, and vanilla. Mix until nice and smooth then slowly add in the dry mix. Continue to mix until you have a smooth batter, then pour in the chocolate chips and fold evenly into the batter. 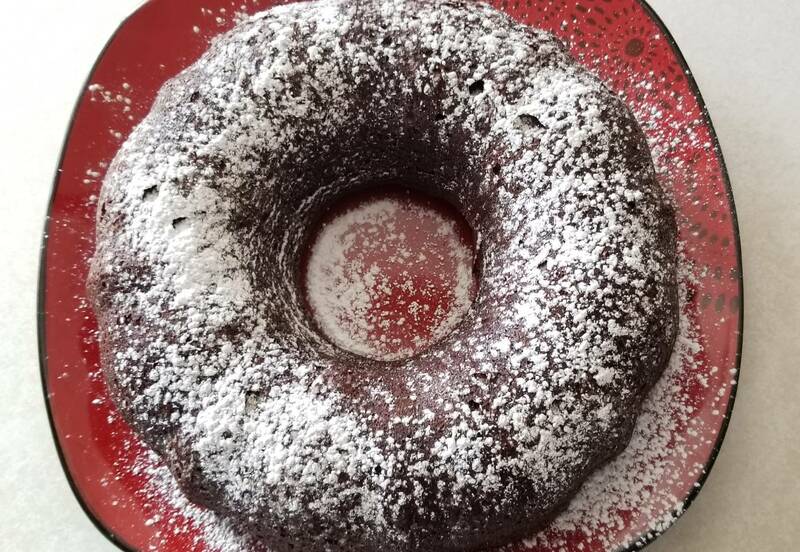 As you notice, I used a bundt pan. I used this only due to the fact that I could not locate my bread pan, and as my daughter received this as a gift some time ago, I figured why not use it. 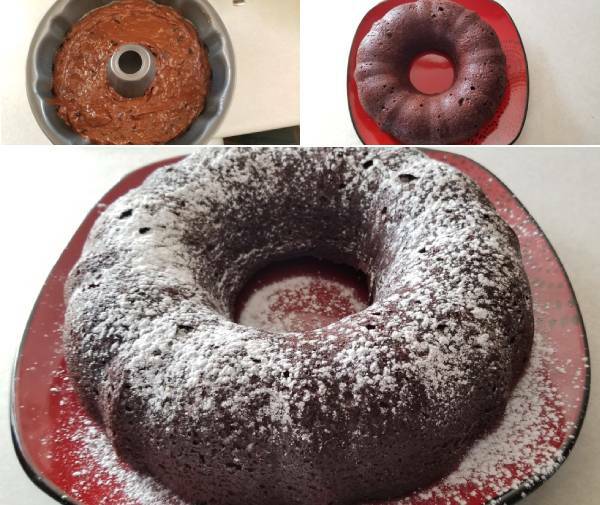 I LOVE THE BUNDT PAN! Spray the inside of the pan with cooking spray or lightly coat with butter. Pour the mixture into the pan and place into the preheated oven for 50 minutes. Perform the usual knife insert about 50 minutes in. Once there is no batter sticking to the knife, remove it from the oven and let cool for about 20 minutes before flipping the pan over onto a serving plate. Sprinkle with powdered sugar and dig in! I’ll admit that I was the first to slice and eat, and boy oh boy was this bread awesome. It was warm so the chocolate chips were nicely melted. That seemed like a special moment. Kidding but not really. Regardless, I called the kids in to have a slice and they were instantly hooked. Let’s just say I got the bananas in them one way or another, and the bread was gone in less than one day. That’s always a great sign of a delicious recipe! Hope you enjoy!